I love the USA. It is a place of great diversity, from its people and regions to some of the world’s most amazing landscapes, and nothing beats a good old road trip to see the sights and meet the locals. I have always wanted to discover the New England region on the East Coast and what better time to do it than in autumn — to see the ‘Fall Foliage’. New England is a collection of six states — Connecticut, Rhode Island, Massachusetts, Maine, New Hampshire and Vermont. All of them are within easy driving distance from Boston and even New York. Each state has its own unique charm and are all well worth a visit. We headed out from New York, but Boston is also a great starting point for a round trip. The smallest of all the states in the USA, one of its most famous towns is Newport. We stopped for lunch, but you could spend a few days here exploring this glamorous coastal town, with its yacht filled harbour, which has played host to the America’s Cup sailing many times and the ‘Gilded Mansions’ built in the late 1800’s as the summer homes of the nation’s wealthiest families. This state is home to the Cape Cod region known for its beautiful beaches, coastal communities and the islands of Nantucket and Martha’s Vineyard. If visiting in late autumn you can see the cranberry harvest at one of the cranberry bogs. Massachusetts is a state filled with history and there are so many places to stop and take it in. See the rock where the pilgrims landed in Plymouth, or discover more about the witchcraft trials in Salem. Spend time in Boston for more American history. A tour of the ‘Freedom Trail’ in the city gives a great insight into the American revolution, plus it’s also a great city to wander or cycle around with all its different neighbourhoods. 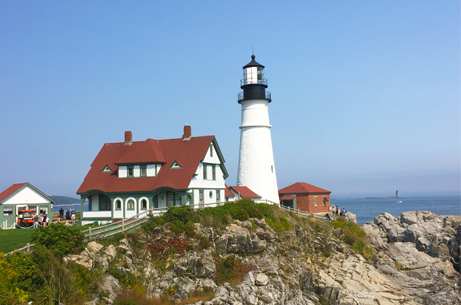 Heading north along the east coast you end up in Maine, known for its spectacular rocky coastline and nature areas. Dotted with numerous lighthouses, lobster shacks and sandy beaches this is a state that deserves some attention. Make sure to try a famous lobster roll at any of the quaint coastal villages such as Camden or Rockport. Or stay in Kennebunkport, with its ship building roots, in one of the historic inns. Visit some of the galleries, souvenir shops and sample some of the great cuisine on offer. Detour a few minutes out of town to see the ‘Bush compound’ summer home for the Bush family. The secret service detail has been known to queue at the Clam Shack for the lobster rolls — voted the best in the USA! Then head further north to Bar Harbor, which although a bit of a drive (400km from Boston), is a must on a visit to Maine. Located on Mount Desert Island, this town is the base for exploring the magnificent Acadia National Park. The park is spread over a massive 46,000 acres with miles of shoreline and hiking trails to explore. There are also over 70km of carriage ways to cycle or walk. While in Bar Harbor hop on the Lulu Lobster boat for a sightseeing tour and lobster fishing demonstration, and get to handle some freshly caught lobster. Bar Harbor is also a stop for many cruise ships so the town has plethora of shops and eateries to explore. Lobster is on every menu and definitely worth sampling. From the coast we headed inland to New Hampshire and the magnificent White Mountains, the highest mountain range in the north east. A drive through this area gives you a chance to see the fall foliage at its best and maybe even spot a moose! We spent some time exploring Franconia Notch State Park, walking into the Flume Gorge with its waterfalls and covered bridges, and taking the Cannon Mountain Aerial Tramway for spectacular panoramic views. En-route south we stopped at Polar Caves Park where you can explore nine caves formed as granite boulders were dropped by the movement of a glacier in the last ice age. Continuing south you hit the Lakes Region of New Hampshire — with over 273 lakes and ponds there is too much to see and do on a road trip! This is a place worth returning to. In summer the area is filled with visitors and city dwellers escaping to their lakeside cabins or mansions – while in winter the region is completely transformed as lakes freeze solid and only a few locals remain. Explore local towns and villages, try wine at Hermit Woods — locally produced from various fruits and berries found in New Hampshire, rather than grapes. Go hiking on one of the many trails throughout the area, or visit Squam Lakes Natural Science Centre. This education centre and zoo focuses on New Hampshire’s natural world with fascinating exhibits and a chance to see many of the animals native to NH such as the mountain lion, black bear and the bald eagle. Like its neighbour New Hampshire, this is a state filled with natural beauty. With mountains and forests to explore it’s worth a visit at any time of year. Go skiing in Stowe, or see Vermont’s rural heritage and try local produce in quaint historic villages such as Woodstock. Leave the main roads behind and go in search of some of Vermont’s 100 covered bridges. We took about 10 days to tour New England, covering over 1,500km of some of the most picturesque, peaceful and beautiful places I’ve seen. Many places seemed like they were straight out of a fairytale and I’m wondering already — when can I return?